There’s a particular feeling you get when you cinch yourself into a pair of four-season winter boots. It’s an electric mix of invincibility and discomfort as you adjust your gait to a ramrod sole that’s meant for kicking snow steps and front pointing all day. Serious boots were built for one thing, and that’s not bending in the middle just where your foot likes to flex. La Sportiva’s Makalu is no exception. The Makalu is a classic mountaineering leather boot with a full steel shank that’s tough enough to be the glue between your crampons and you on all but the steepest ice. Its 3mm thick treated leather is hardy and its sole should keep you going over miles of the sharpest scree. All that and you want comfort? You’ve gotta be kidding. Well, not quite. Asking for a boot that will kick steps all day and give you a super-comfortable walk in on the trail is asking a bit too much of designers. That’s why they gave us approach shoes. But you can demand a boot that’s the best available compromise. Sportiva have given the Makalu a rocker in its sole, so each step you take you put your heel down and then gently rock forward. That helps, but it’s still not going to be as comfy as your favorite running shoe. So if you’re just planning some backpacking and hiking below the snowline, these aren’t the boots you want. If you’re venturing into snow for light mountaineering, you’ll love the fact that their treated leather doesn’t wet through. You’ll swoon over the adjustable and thick padded tongue that supports my foot on the downhill like no other boot I’ve owned and you’ll delight in the fact that they keep your toes pretty darned warm. Just remember. These aren’t double plastics nor are they insulated, so be wary of taking them on multi-day expeditions to high altitudes and seriously cold conditions. They’re also not the right boot for ice climbing. But for light mountaineering and winter hill walking, they’re hard to beat. At the end of the day, fit is everything. So compare these against the Scarpa Manta, a boot that’s as much of a classic as the Makalu and has been getting rave reviews and the Raichle 60 Degree. 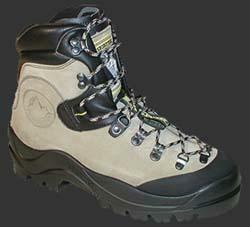 Both these boots came out top in a comparative test by Trail Magazine. The Makalu will be a popular boot 100 years from now. It’s just a classic—a fairly heavy, rugged boot with thick three-millimeter leather uppers and a moderately stiff midsole. Flexible enough for hiking, stiff enough for pretty serious crampon use, thick enough to keep your feet warm in fairly chilly conditions. The best strong boots for the long dry approaches and snow climbs on the Oregon Cascades volcanoes are the La Sportiva Makalu. They are snap-on crampon compatible, are lighter than plastic, won’t get wet (really) and you can hike in them for miles (once broken in a bit and the right fit). All said, I think the Makalus are excellent pieces of gear. They may not be built for heavy trail pounding, but they perform solidly in uneven terrain, and despite discomfort in their fit, inability to dry when wet, and average traction, I feel like I can always count on them for stiffness, support, and versatility when I need it most. I see in one of the comments some genuine complaints about my review in which I say the leather does not wet through. It is a fair point in so far as all leather boots will wet through after a few days above the snowline. This is exactly the reason why expedition grade boots such as the Scarpa Omega are made of plastic. I’ve found the Makalu to be a great boot but it does have its limits. They do wet through. After two days in summer snow, mine did. Yes, they were Nikwaxed, yes the seams were sealed with silicone, yes I was wearing gaiters. At first, having read a lot of non-objective reviews like this one (you’ll “swoon” over the tongue? That’s not really helpful), I figured it must be my imagination. So I did a few tests, and yes, as common sense would suggest, leather is not as waterproof as the reviews like this one suggest. Now, they’re probably plenty waterproof for most everything you’ll do, barring lots of wet slushy summer snow. So I recommend them heartily. But nothing is as perfect as the hype. That is a fair point. The truth is that no leather will keep going on multiday expeditions in the wet unless it has a chance to dry out a bit in between. But I sitll stand by my comment that these stay dry way better than boots I was wearing 10 or 20 years ago. That said, I would not recommend these for major expeditions in cold conditions. For that you can't beat double plastic boots.